I am sure you all know of The Knight's Lance, Panini's blog. 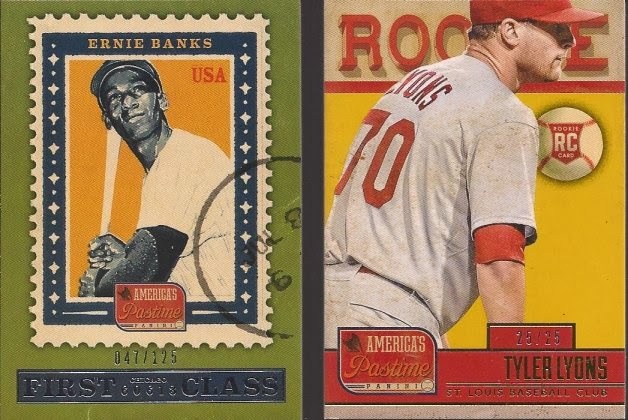 It's in the sports card blogroll, because if it wasn't, I really wouldn't know about it. Along with great info and previews of their upcoming products, they run contests from time to time. I have entered a few, and dangit if I didn't get an email about a week ago asking for my mailing address. I scored a free box of Panini America's Pastime. I am not a high end buyer. I am sure I will get skunked, and those high ends are more of trading card gambling to me than collecting. I like my sets and my collections. But if you have any chance for free, never pass it up. The box came today, so I ripped it live. If you don't want to hear my droning voice, or need a better look at the pulls, let's do some scanning. Here's the two "base" cards from the box. Glad I pulled a player from a team I collect. 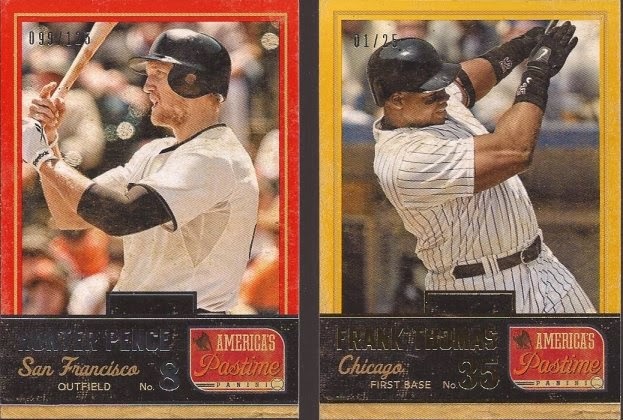 You either get 3 base and one insert or two and two. Appears I got the two and two. I like the designed on the Banks card. Has a nice old feel to it's look. The Lyons seems a little crowded, unless Tyler is really that huge a guy. Here are my two guaranteed relics. I really have no clue who they are, and whether they would be considered great, good, okay or meh pulls. And in all that, these cards are up for trade. It's a shame these are all sticker autos. That Ortiz makes the 5th hit of his I have pulled in my collecting career. Yes - FIVE! I have pulled 4 relics of him, and now this auto. 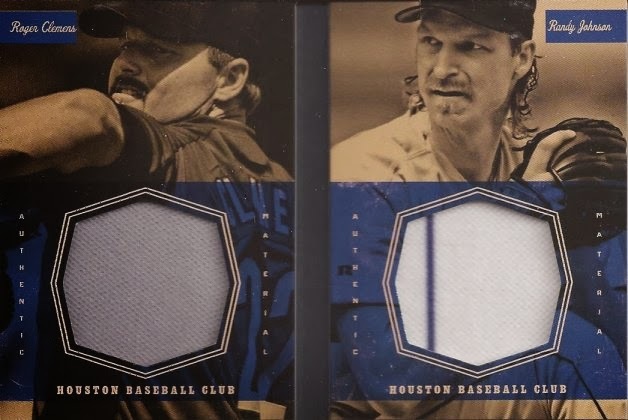 If you want to count a SP image card from Topps, then six hits. Unbelievable. No clue how good Rusin may be, but it's a gold parallel numbered to 15. That Fernando, though, to me is the hit of the box. I am not sure what I am doing with it, so if you want to make an offer, I'll listen. If you watched the video above - yes, I am an idiot. I said "Rockies" on the Johnson swatch, and he was never a hometown player in the Mile High city. I should have said "Diamondbacks", because that stripe is purple, and certainly not from an Astros uniform. I also seem to get a lot of Clemens, though this is the first hit I have of him. If you don't know, I am a Roger hater. So that was a fun rip. Considering the price I paid, it was an awesome box. If I have bought that, well, I think I may have been a bit disappointed. However. if you see something you like, let's talk. I won't make any promises on what I'll accept in trade, but a deal can always be hammered out. If you haven't sent me anything for that Tribute relic /25 of Konerko, that Scott Rice will make me feel like a happy king. I usually like Panini's products, but I'm not sure about these. As you said, though, it's free. Why not? ...and the Red Sox fan pulls no Ortiz relics. If they're available, I'd be interested in the Banks and Rusin. I'm not sure why anyone would buy that, but as you say, for that price, BITCHIN' BOX! 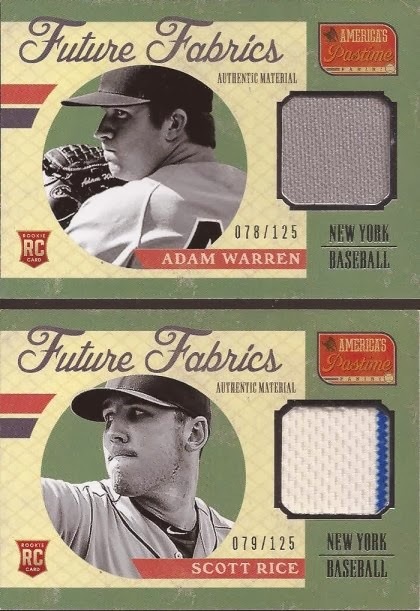 I'd be interested in trading for the Adam Warren relic if it's still available. I'd be interested in the Lyons rookie! Yep was pretty happy with my book as I collect Autos was super happy my book had a graph in it and the numbering was nice to with the 3/5 the only thing that would have been better would have been if it was Angels pieces instead of D-Back pieces but guess they didn't have any yet and card says Arizona. Would have love to get the Ortiz auto, Are you looking to trade it? lmk I have a spreadsheet of auto's available about 5,000 of them everything from 8x10's cards 3x5 and all sports so maybe we can work something out lmk my email is soskinfamily@yahoo.com and I can send you the sheet. it was a great deal for FREE! the right price I would never buy the product to much for me! If there's any Cardinals you're not attached to, I would definitely be interested in them. I don't really ever buy unlicensed stuff but they do go into my binders.